It is public knowledge that the media tries to catch our eye with interesting – and often times, misleading – headlines. Such was the recent hoopla about Pope Francis’ interview in which he mentioned the word “gay.” I wish I didn’t have to burst anyone’s bubble, and I really wished Papa Paco had said something really, well, significant, regarding LGBT rights; but the truth is that he didn’t say absolutely anything important. Let us start in the beginning. Papa Paco has already surprised the world with his humility, his openness, and his matter-of-factly attitude. The media world was caught off guard by a Pope that is as open as Francis. In comparison with Blessed John Paul II who was charismatic but reserved, or with Benedict XVI who was as secretive as any Pope in the Middle Ages, Francis’ attitude is something completely new. Moreover, we do not expect the representative of an organization as secretive as the Roman Catholic Church to be as open with his remarks as Francis has been. Add to this the fact that the US-centric media, with centuries of lay-led Protestantism in this country, has no clue how the Roman Catholic Church operates, nor does it understand the matters of Roman Catholic doctrine, dogma, traditions, etcetera. 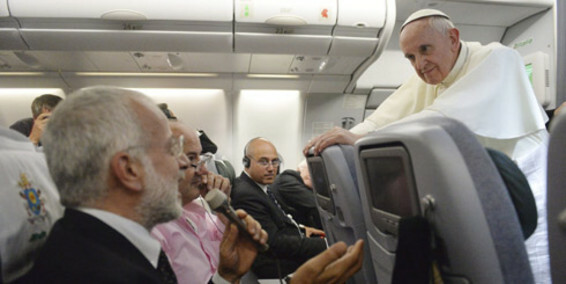 When Pope Francis met with the media on the papal aircraft, he was showing his openness. This is still shocking, of course. However, by now we should start getting acquainted with the ways of the new Pope. Therefore, my first call to the US-centric media is: stop exaggerating! Second, please research before you print! Really. A really close examination of the interview and a google search regarding the Catholic Church’s position on LGBT issues should be enough to understand that what Papa Paco said is completely in line with Catholic moral doctrine. He has changed nothing! To the LGBT advocate groups in the USA and around the world, I ask that, please, for the love of all the souls we have lost to religious intolerance, DO NOT play the game! You are actually doing more harm than good! Given that the Pope wants us to read what the Catechism says about these issues, let us take just a quick look at the one that made headlines: homosexuality. This is what Francis believes regarding homosexuality. Moreover, he also exposes that the Church is called to act with care and compassion. Again I quote the Catechism of the Roman Catholic Church, Part Three, Section I, Chapter 1. Article 7.II.1822: “Charity is the theological virtue by which we love God above all things for his own sake, and our neighbor as ourselves for the love of God.” Charity is the theological virtue, according to Roman Catholic dogma, which calls us to love God and to love neighbor as ourselves. Those who love God and love neighbor as themselves will not judge. Living by this virtue applies even to the Bishop of Rome and Vicar of Christ. Thus, when Papa Paco said “Who am I to judge?” he is just reciting the Catechism and even the Bible! Later on the same part of the Catechism, Article 7.II.1829 we read: “The fruits of charity are joy, peace, and mercy; charity demands beneficence and fraternal correction; it is benevolence; it fosters reciprocity and remains disinterested and generous; it is friendship and communion: Love is itself the fulfillment of all our works. There is the goal; that is why we run: we run toward it, and once we reach it, in it we shall find rest.” Note here that one of the things that charity demands is… FRATERNAL CORRECTION! With that, what Papa Paco actually told the reporters is that, because he loves and cares for the gay and lesbian person, he is called, compelled, mandated even, by Christ and by the teachings of the Church to CORRECT our ways. Doesn’t sound that progressive now, does it? Perhaps is because I have spent too much time studying Roman Catholicism as a Protestant. Perhaps is because I just can’t believe that the media was so dumb as to be duped by the Pope. Perhaps is because I love being non-celibate, happily married gay man… but I just can’t take the whole hoopla regarding this interview to Papa Paco anymore. But really, who am I to judge Papa Paco? The guy knows what he’s doing and how to play the media! Go Paco!